Through trading, raiding, fighting and colonization, build upon your power in order to achieve the ultimate goal of calming the throne! It is the age of Conquering, Pillage, and Trade. Ragnar Ironhand, the King of Kaupang grows old and is looking for his most suitable successor. Ragnar gathers his four children and challenges them to leave Kaupang in search of fame and fortune in foreign lands. Whoever returns home as the most prosperous sibling, will lay claim to the throne. Gather your Viking warriors and set sail, but beware the whims of the fickle Norse gods as well as of your backstabbing and ambitious siblings, who are all vying to claim the throne for themselves. 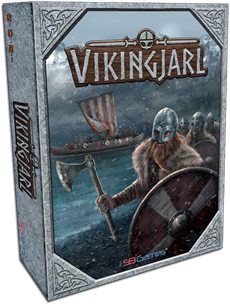 Vikingjarl is available on Kickstarter right now!